In a characteristically typically literal manner, President Gurbanguly Berdymukhamedov illustrated the point by conducting a video conference call on January 21 with members of the Cabinet and several senior regional officials. Television images showed a wall-mounted screen transmitting the images of nervous-looking underlings standing to attention, scribbling away furiously in their notebooks and never looking to camera, lest they meet Berdymukhamedov’s eye through the ether. The one-to-one briefings culminated with Berdymukhamedov pressing a button on his laptop and a print-out of a presidential order appearing before the official in question. “In this way, with digitalization deployed across the country, it is possible to execute government decisions more quickly,” cooed a state media report on the conference call. As the Vienna-based Chronicles of Turkmenistan reported on January 17, the government has taken to blocking virtual private network, or VPN, applications that are typically used to bypass restrictions on accessing social media. Attempts to use such applications apparently now will jam Turkmen SIM cards. The Google Play app store has also apparently been blocked. News of an order from Berdymukhamedov to put together a new human rights commission very much fits that mold. The adoption of a new code of judicial ethics on January 19 is in the same vein. While it would be unfair to second-guess what will happen with either of those developments, experience should condition the Turkmenistan-watcher to low expectations. The government’s previous supposed attempt at finally tackling its human rights issues were farcical. The first-ever annual digest on human rights, published last year, not only failed to address many pressing issues but was found, on investigation, to contain various passages plagiarized from a report by Kazakhstan’s human rights ombudsman. In another noteworthy feat of whitewashing, government-friendly news website Arzuw on January 17 published what it termed an analysis of the country’s food markets. As the website explained, this was intended to put lie to the incessant tales of food shortages and lines outside stores. And anyway, said Arzuw, if there are any lines, it is only because of speculators. Also, the people themselves are to blame for preferring bazaars to supermarkets. Russian media continued to report that Turkmenistan was increasing security measures on its border with Afghanistan, adding to the pile of similar worrying reports from last week. 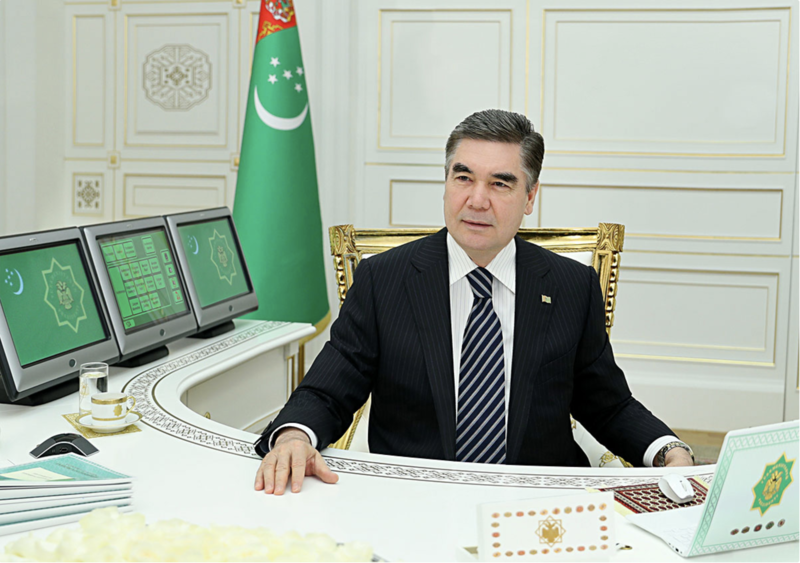 But then, Ashgabat-based outlet Turkmenportal on January 17 cited a representative with the State Border Service as saying that "all was under control" along the border. The same report included a denial from the Defense Ministry of recent reports about the alleged mobilization of reservists. When the government isn’t denying, it is simply in denial. How else to explain why Berdymukhamedov should, on January 18, have approved plans to build yet another international airport, this time in Mary province? Officials have boasted that the recently built multibillion dollar terminal in Ashgabat can process more than 1,600 passengers every hour, but the amount of people traveling through the airport is nowhere near that. In light of Turkmenistan’s historic discomfort with reliable data, it was telling to see Russia this week sending a team from its Rosstat statistics service to advise their Turkmen counterparts on data-monitoring and reporting. Russia-related news is keeping energy-market observers on tenterhooks as it does not seem that Gazprom has yet – contrary to expectations – resumed importing gas from Turkmenistan. In a signal of possible movement, Russia’s Deputy Foreign Minister Grigory Karasin on January 16 held talks with Turkmen Ambassador Batyr Niyazliev. No revelations about the topic of discussion were forthcoming, however. RFE/RL's Bruce Pannier this week put together a comprehensive assessment of the state of things in the relationship between Moscow and Ashgabat. Pannier wonders aloud if this sometimes-on but mostly-off tryst may be entering a new cordial phase. Spoiler alert: Maybe, maybe not. In a rare development, the State Bank of Foreign and Economic Affairs, or TFEB, published a sketchily detailed update regarding its activity. It noted that it last year signed a previously undisclosed 121 million euro ($138 million) credit agreement with Germany's Commerzbank to finance the purchase of agricultural equipment. TFEB also finalized plans for a series of Japanese loans first signed in July for a new power plant in the Lebap region. There is what appears to be a sign of progress being made on the Turkmenistan-Afghanistan-Pakistan-India natural gas pipeline. According to media in Pakistan, the ruling party there is recommending expedited implementation of the project in order to avoid chronic shortages down the road. Then again, Pakistan is also pushing ahead with a rival route to import gas from Iran. That rivalry is not going to inspire regional amity. Ashgabat and Tehran have been embroiled in some unseemly squabbles over the past few years. Turkmenistan last week reportedly banned small- and medium-enterprises doing business with Iran from its currency exchanges. On the face of it, this looks like compliance with the U.S.-imposed sanctions regime, although it is seems as likely that Ashgabat is just looking for any excuse to hold onto foreign cash.